An Opinion On Sports: When "50" is Like "47"! 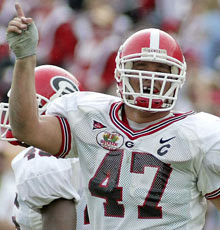 North Carolina's Tyler Hansbrough plays basketball like former UGA gridiron great David Pollack played football. From never giving up on a play, to making a big play when your team has to have one, to making everyone around you a better player, he is definitely cut out of a DP mold. Now we know what David would have been like on the Hardwood! All the media guys say TH will not be a great pro player. I respond with "Who Cares"? He's what college sports are all about! Hang around Chapel Hill one more year Tyler! You only get one run at college ball.